A Chinese Feast of New Temptations! Tai Thong, a restaurant name highly popular in our F&B industry has recently launch more new temptations at all their outlets. Diners can enjoy a sumptuous treat of their modern injections of classic dishes concocted by the Tai Thong team of chefs in various outlets from now till end of the year. Starting out 1971, the multi-award winning Tai Thong restaurants has always been a pioneer in serving up authentic Cantonese cuisine in our F&B scene. Today, Tai Thong Group is still one of the leaders in Chinese cuisine in our culinary scene and its many outlets are serving up a list of classic dim sums and Chinese dishes injected with touches of modern influences. The Tai Thong Group has many outlets with some pork free outlets as well as non-halal outlets. From now till end of the year, check out these promotions going on currently at the various Tai Thong restaurants. 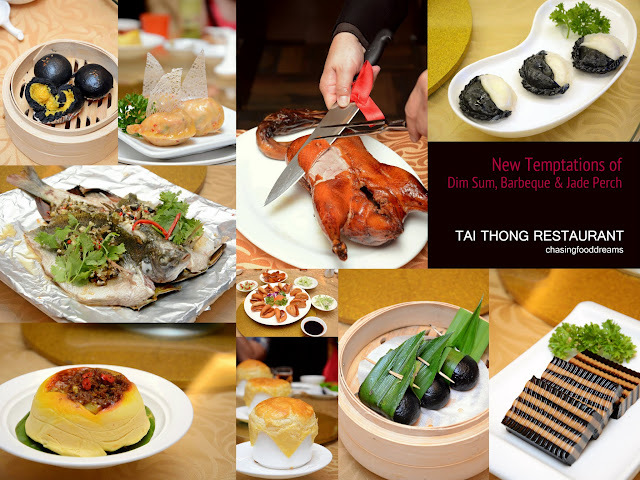 For Dim Sum lovers, Tai Thong is proud to present 2 series of Tai Thong Dim Sum. First up, the Black Temptations Dim Sum series features four delectable dim sums from dim sum Chef Loo Kok Seng. Pan Seared Dumpling with Fish Paste & Cheese (RM9.80), an East meets West concoction of fish paste and cheese is delightfully enveloped in a black and white dumpling skin. I do admit to enjoy this ying and yang combination. Enjoy this hot for the ooey-gooey melted cheese sensation! Who would ever thought of combining the king of fruit with the rich salted egg? Charcoal Bun with Durian & Salted Egg (RM9.80) was very well received by many who was also surprised at how the flavours of this pairing turn out to be. The black bun and its filling turned out to be very rich and sinful in flavours as advised by many foodies. Do try the refreshing Chilled Coffee Flavoured Jelly Cake (RM5.80). I enjoyed the big hit of coffee note in the jelly balanced with a layers of creamy jelly. The lightly chewy texture is another plus point to this dim sum dessert. For those who enjoy spicy flavours, don’t miss the Spicy Szechuan Dim Sum series. Showcasing four spicy dim sums, this series will certainly heat up your senses. The only gripe here is one might need to wait for a little while as this series is only available in November only. A hodge-podge of yellow chicken glutinous rice topped with spicy Nyonya sambal wrapped in bao bun, the Chicken Bun Nyonya Style (RM10.80) proved to be a winner in my books. The pungent salty and lightly sweet Nyonya sambal was the highlight of this dim sum. Inspired by the classic Kai Wo Bao, this version is very tasty and piquant. Dumplings are also spiced up in heat with this Pan Seared Spicy Dumpling (RM8.80). Nicely pan-seared on one side together with a piece of crispy white lacy wrap, the minced meat and seafood dumpling has a good bouncy bite with spicy savory flavours. Definitely one of my favorite spicy dumplings of the meal! Spicy Dumplings in Pepper Soup (RM9.80) showcases another delicious minced meat and seafood dumpling in a peppery broth. There’s plenty of black pepper in the dumpling for extra peppery heat too. This is a dish I would definitely reorder again as it has bold spicy flavours that worked well with the seafood dumpling. The dish that took me by surprised was the least dim-sum looking dish of Seafood Curry with Puff Pastry (RM11.80). Beautifully baked golden puff pastry is capped on a bowl of piping hot seafood curry. The piquant curry is tastefully spicy in heat and has nice chunks of squid, prawn and fish. A tad oily but I still enjoyed the curry with the buttery flaky puff pastry. Besides the dim sum promotions, diners can also enjoy Tai Thong’s current Barbeque Promotion and Jade Perch Promotion at all their outlets for a limited time only. The Barbeque Promotion is certainly one to watch out for as there are a few barbeque dishes specially concocted by Tai Thong’s chefs. First up, a majestic looking Flaming Beijing Duck served with Crispy Bun (RM88.80) had all of us experiencing a fiery flaming action as we watch the Beijing Duck being lite up! I didn’t manage to catch the flaming action but one look at the beautifully lacquered duck with its glistening skin had me drooling at sight. With quick and deft slicing actions, our Beijing duck had its skin nicely cut into rectangle pieces and serve with the side of crispy Mantao buns, scallion, cucumber and hoisin sauce. The skin is gorgeously crisp and nicely flavoured with a touch of caramel sweetness. Sandwich everything together for a mouthful of delectable crispy duck skin with a good bite from condiments. Simply delicious! The rest of the duck was whipped back into the kitchen for a second preparation for the duck. Our preferred method was Salt & Pepper style. Unlike most Salt & Pepper dishes, this one was not battered and deep fried, allowing us to enjoy the dark meaty flavours of the duck. Fish lovers will be pleased with the Jade Perch Promotion, an Australian fish that is rich in Omega-3 fish oil and has a smooth, soft and sweet flesh. I always look forward to going out. A good tip would be to look out for those places with interesting concepts. This place is pretty amazing. I came up here with a friend. The New York Event Venues were spacious and food was great.